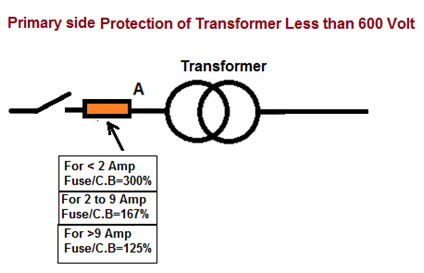 The over current protection required for transformers is consider for Protection of Transformer only.Such over current protection will not necessarily protect the primary or secondary conductors or equipment connected on the secondary side of the transformer. 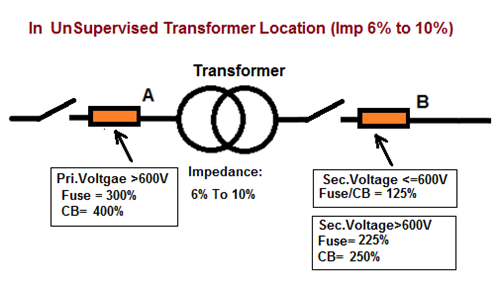 When voltage is switched on to energize a transformer, the transformer core normally saturates. 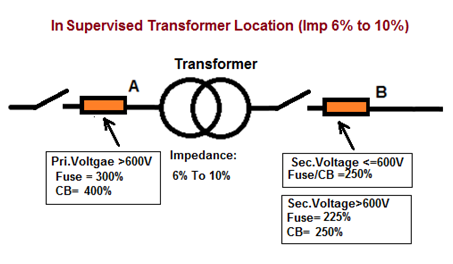 This results in a large inrush current which is greatest during the first half cycle (approximately0.01 second) and becomes progressively less severe over the next several cycles (approximately 1 second) until the transformer reaches its normal magnetizing current. 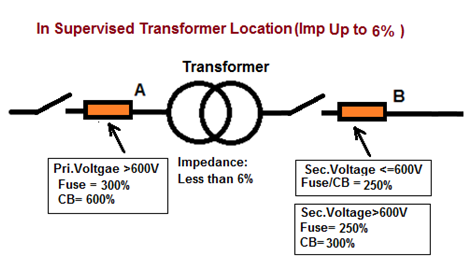 To accommodate this inrush current, fuses are often selected which have time-current withstand values of at least 12 times transformer primary rated current for 0.1 second and 25 times for 0.01 second. Some small dry-type transformers may have substantially greater inrush currents. To avoid using over sized conductors, over current devices should be selected at about 110 to 125 percent of the transformer full-load current rating. And when using such smaller over current protection, devices should be of the time-delay type (on the primary side) to compensate for inrush currents which reach 8 to 10 times the full-load primary current of the transformer for about 0.1 s when energized initially. A supervised location is a location where conditions of maintenance and supervision ensure that only qualified persons will monitor and service the transformer installation. 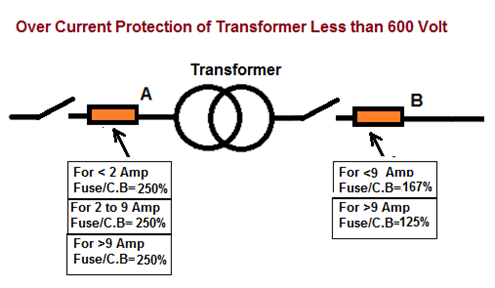 Over current protection for a transformer on the primary side is typically a circuit breaker. In some instances where there is not a high voltage panel, there is a fused disconnect instead. Rating of Primary Fuse = 3X39A= 118A, So Standard Size of Fuse =125A. OR Rating of Primary Circuit Breaker =6X39A=236A, So Standard Size of Circuit Breaker =250A. Full Load Current at Secondary side=750000/ (1.732X415) =1043A. Rating of Secondary of Fuse / Circuit Breaker = 1.25X1043A=1304A, So Standard Size of Fuse =1600A. Rating of Pri. Fuse = 3X87A= 262A, So Next Standard Size of Fuse =300A. OR Rating of Pri. Circuit Breaker =4X87A=348A, So Next Standard Size of Circuit Breaker =400A. Full Load Current at Secondary side=10000000/ (1.732X11000) =525A. Rating of Sec. Fuse = 2.25X525A=1181A, So Next Standard Size of Fuse =1200A. OR Rating of Sec. Circuit Breaker =2.5X525A=1312A, So Next Standard Size of Circuit Breaker =1600A. Rating of Primary Fuse = 3X39A= 118A, So Next Lower Standard Size of Fuse =110A. OR Rating of Primary Circuit Breaker =6X39A=236A, So Next Lower Standard Size of Circuit Breaker =225A. Rating of Secondary of Fuse / Circuit Breaker = 2.5X1043A=2609A, So Standard Size of Fuse =2500A. OR Rating of Primary Circuit Breaker =4X39A=157A, So Next Lower Standard Size of Circuit Breaker =150A. First notable Condition is Primary Over current Protection. In Unsupervised Location Fuse in Primary side is 300% of Primary Current or Next Higher Standard size and in Supervised Location is 300% of Primary Current or Next Lower Standard size. Here Primary Over current Protection is same in both conditions (300%) But Selecting Size of Fuse/Circuit Breaker is Different. Second notable Condition is Secondary Over current Protection increased from 125% to 250% for unsupervised to Supervised Location. Rating of Pri. Fuse / C.B at Point A= 300% of Pri. Full Load Current or Next Lower Standard size. Rating of Primary Fuse = 3X1A= 3A, So Next Lower Standard Size of Fuse =3A. Rating of Sec. Fuse / C.B at Point A= 167% of Pri. Full Load Current or Next Lower Standard size. Rating of Primary Fuse = 1.67X4A= 6A, So Next Lower Standard Size of Fuse =6A. Rating of Pri. Fuse / C.B at Point A= 125% of Pri. Full Load Current or Next Higher Standard size. Rating of Primary Fuse = 1.25X18A= 23A, So Next Higher Standard Size of Fuse =25A. Rating of Pri. Fuse / C.B at Point A= 250% of Pri. Full Load Current or Next Lower Standard size. Rating of Primary Fuse = 1.25X38A= 48A, So Next Higher Standard Size of Fuse =50A. One of the most misunderstood and confused concept is difference between Bonding, Grounding and Earthing. Bonding is more clear word compare to Grounding and Earthing but there is a micro difference between Grounding and Earhing. Earthing and Grounding are actually different terms for expressing the same concept. Ground or earth in a mains electrical wiring system is a conductor that provides a low impedance path to the earth to prevent hazardous voltages from appearing on equipment. Earthing is more commonly used in Britain, European and most of the commonwealth countries standards (IEC, IS), while Grounding is the word used in North American standards (NEC, IEEE, ANSI, UL). We understand that Earthing and Grounding are necessary and have an idea how to do it but we don’t have crystal clear concept for that. We need to understand that there are really two separate things we are doing for same purpose that we call Grounding or Earthing. The Earthing is to reference our electrical source to earth (usually via connection to some kind of rod driven into the earth or some other metal that has direct contact with the earth). In addition, non-current-carrying metallic components in a System, such as equipment cabinets, enclosures, and structural steel, need to be electrically interconnected and earthed properly so voltage potential cannot exist between them. However, troubles can arise when terms like “bonding,” “grounding,” and “earthing” are interchanged or confused in certain situations. In TN Type Power Distribution System, in US NEC (and possibly other) usage: Equipment is earthed to pass fault Current and to trip the protective device without electrifying the device enclosure. Neutral is the current return path for phase. These Earthing conductor and Neutral conductor are connected together and earthed at the distribution panel and also at the street, but the intent is that no current flow on earthed ground, except during momentary fault conditions. Here we may say that Earthing and grounding are nearly same by practice. But In the TT Type Power Distribution System (In India) Neutral is only earthed (here it is actually called Grounding) at distribution source (at distribution transformer) and Four wires (Neutral and Three Phase) are distributed to consumer. While at consumer side all electrical equipments body are connected and earthed at consumer premises (here it is called Earthing). Consumer has no any permission to mix Neutral with earth at his premises here earthing and grounding is the different by practice. But in both above case Earthing and Grounding are used for the same Purpose. Let’s try to understand this terminology one by one. Bonding is simply the act of joining two electrical conductors together. These may be two wires, a wire and a pipe, or these may be two Equipments. Bonding has to be done by connecting of all the metal parts that are not supposed to be carrying current during normal operations to bringing them to the same electrical potential. Bonding, itself, does not protect anything. However, if one of those boxes is earthed there can be no electrical energy build-up. If the grounded box is bonded to the other box, the other box is also at zero electrical potential. It protects equipment & Person by reducing current flow between pieces of equipment at different potentials. The primary reason for bonding is personnel safety, so someone touching two pieces of equipment at the same time does not receive a shock by becoming the path of equalization if they happen to be at different potentials. The Second reason has to do with what happens if Phase conductor may be touched an external metal part. The bonding helps to create a low impedance path back to the source. This will force a large current to flow, which in turn will cause the breaker to trip. In other words, bonding is there to allow a breaker to trip and thereby to terminate a fault. The purpose of earthing is to minimize risk of receiving an electric shock if touching metal parts when a fault is present. Generally green wire is used for this as a nomenclature. Grounding means connecting the live part (it means the part which carries current under normal condition) to the earth for example neutral of power transformer. Grounding is done for the protections of power system equipment and to provide an effective return path from the machine to the power source. 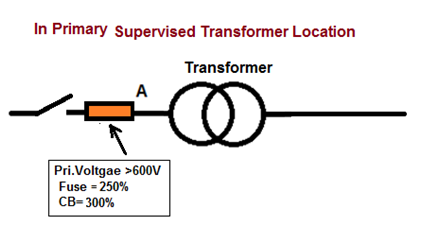 For example grounding of neutral point of a star connected transformer. All electrical/electronic circuits (AC & DC) need a reference potential (zero volts) which is called ground in order to make possible the current flow from generator to load. Ground is May or May not be earthed. In Electrical Power distribution it is either earthed at distribution Point or at Consumer end but it is not earthed in Automobile( for instance all vehicles’ electrical circuits have ground connected to the chassis and metallic body that are insulated from earth through tires). There may exist a neutral to ground voltage due to voltage drop in the wiring, thus neutral does not necessarily have to be at ground potential. There is no major difference between earthing and Grounding, both means “Connecting an electrical circuit or device to the Earth”. This serves various purposes like to drain away unwanted currents, to provide a reference voltage for circuits needing one, to lead lightning away from delicate equipment. Even though there is a micro difference between grounding & earthing. Earth is used for the safety of the human body in fault conditions while Grounding (As neutral earth) is used for the protection of equipments. Do not Ground the Neutral Second time When It is grounded either at Distribution Transformer or at Main service Panel of Consumer end. Grounding act as neutral. But neutral cannot act as ground. Earthing and Grounding both is refer to zero potential but the system connected to zero potential is differ than Equipment connected to zero potential .If a neutral point of a generator or transformer is connected to zero potential then it is known as grounding. At the same time if the body of the transformer or generator is connected to zero potential then it is known as earthing. Earth having zero potential whereas neutral may have some potential. That means neutral does not always have zero potential with respect to ground. In earthing we have Zero Volt potential references to the earth while in grounding we have local Zero Volt potential reference to circuit. When we connect two different Power circuits in power distribution system, we want to have the same Zero Volt reference so we connect them and grounds together. This common reference might be different from the earth potential. Neutral wire in grid connections is mandatory for safety. Imagine a person from 4th floor in a building uses Earth wire (which is earthed in the basement at Basement) as neutral to power his lights. Another Person from 2nd floor has a normal setup and uses neutral for the same purpose. Neutral wire is also earthed at the ground level (as per USA practice Neutral is Grounded (earthed) at Building and as per Indian Practice it is Grounded (earthed) at Distribution Transformer). However, ground wire (Neutral wire) has a much lower electrical resistance than Earth Wire (Earthing) which results in a difference of electrical potential (i.e. voltage) between them. This voltage is quite a hazard for anyone touching a Earth wire (Metal Body of Equipment) as it may have several tens of volts. Ground is a source for unwanted currents and also as a return path for main current. While earthing is done not for return path but only for protection of delicate equipments. It is an alternate low resistance path for current. Earth is used for the safety of the human body in fault conditions while Grounding (As neutral earth) is used for the protection of equipments. Installed indoors Vault (With construction of reinforced concrete that is not less than 100 mm (4 in.) thick. Vault shall not be required if where the surroundingStructure is classified as fire-resistant construction. Gas service meter relief vents. The water’s edge of a swimming pool or any body of water.